In the Turtles’ Lair, Splinter reprimands Michaelangelo for his over-eating, when suddenly, he and the Turtles slowly begin to float towards the ceiling. Meanwhile, in the Technodrome, miles below the Earth’s surface, Shredder revels over the invention of his “gravity altering” device. With it, he can bring the city to its knees. Shredder increases the mechanism’s anti-gravity potency to go beyond the subterranean level. Krang warns him to stop, because the device hasn’t been perfected yet. Shredder insists that he can’t wait any longer – he wants the city to grovel at his feet NOW! Krang is incensed with his “insane, power-mad” partner in crime. At Channel Six News, while Irma tells April about finally finding “Mr. Right,” she slowly rises toward the ceiling. April quickly follows suit. In fact, everyone in the building is floating in mid-air. Mr. Thompson, April’s boss, is convinced that somehow the Turtles are responsible. April contacts them for help, but they are suffering the same fate. Meanwhile, back inside the Technodrome, Shredder once again increases the power, Krang warns him that he will overload the system but Shredder pays him no mind. And sure enough, the Gravity Altering Device shuts down, causing April and her fellow workers at Channel Six as well as Splinter and the Turtles in their secret lair to fall to the floor. While the TMNT are confused, Splinter is convinced that Shredder is responsible. Shredder isn’t deterred by the momentary set back, so he makes a few emergency adjustments and reactivates the Gravity Altering Device. While on patrol, using their “gravity scope” to search for the source of the “gravity glitch,” the TMNT come into contact with a “wave” emanating from under the street. Before the guys can turn around, they’re pulled into it, along with everything else on the street. The Turtles are stuck – unable to move! Meanwhile, back in the Technodrome, Shredder gloats over his accomplishment. Krang demands to know what is so great about a city that can’t move? Shredder informs him that a city that can’t move can’t fight back, and he sends Rocksteady, Bebop and some Ninja Foot Soldiers (all wearing anti-gravity boots, of course) up to the surface. While Bebop and the Ninja Foot Soldiers “shoot and loot,” Rocksteady decides that he is going to have some fun with the Turtles, only to have them get the best of him and steal his anti-gravity boots. With the new gear, Michaelangelo is able to score two more pairs. Meanwhile, Donatello realizes that if they were able to get to the Turtle Blimp, they too could fly, like the birds overhead that are above the pull of gravity (push of anti-gravity?). Michaelangelo returns with four boots for six feet, but Donatello has another clever idea – one which you have to see to believe. It requires one Turtle to share his right boot with the left foot of one Turtles and his left boot with the right foot of another. After learning of Rocksteady, Bebop and the Foot Soldiers’ failure, Shredder heads for the surface to take personal charge of things. 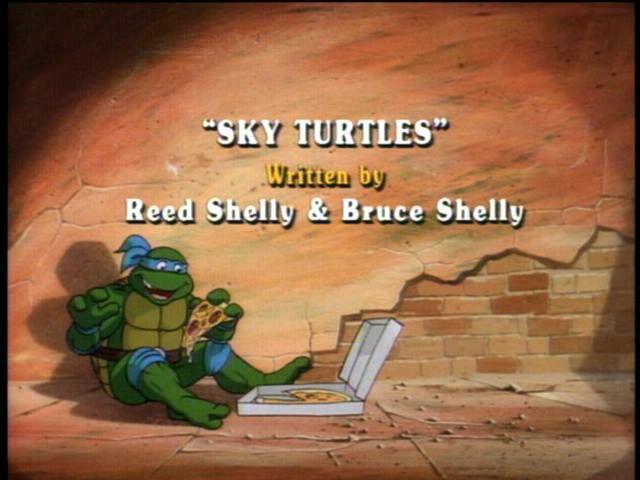 Meanwhile, as the Turtles fly over the city in search of the source of the Gravity Altering Device. Shredder, via his pneumatic module, crashes through the earth to see them flying overhead. The villain produces a portable Gravity Altering Device and reverses the flow, causing everything not tied down, and a few things that are – like tall buildings – to float up into the sky and away. One of these buildings is the Channel Six News building! April and Irma are hanging upside down on the transmitter tower as the building is being pulled loose from its foundation. The Turtles arrive in time to save them and anchor the building to another, taller building that is still secure – one that looks like the Empire State building. From here, the TMNT can see “pulse waves” emanating from under the city streets. The lads believe this to be the source of the “Reverse Gravity Force.” With the help of the Channel Six News satellite dish, the Turtles are able to reverse the Reverse Gravity Force, thus allowing all the buildings/structures to fall back to earth in their original locations. Krang is furious and turns the Gravity Altering Device from “maximum power” to “super maximum power,” causing it to be sucked out of the ground and arc across the horizon. With gravity back to normal, Rocksteady and Bebop come hurtling back toward earth and land atop Shredder. All three of them scramble back into their pneumatic module and disappear back into the Earth’s core, leaving the Turtles dancing in the hot lava-like substance left behind.